What is the Black Desert Online (BDO) game? Black Desert Online is a sandbox-oriented massively multiplayer online role-playing game by Korean video game developer Pearl Abyss. Black Desert Online uses Pearl Abyss' own "Black Desert" engine specifically created to handle the fast rendering required for its seamless world and large-scale castle sieges. It was released in Korea, Japan and Russia in 2015, North America and Europe in 2016, South America, Turkey, Middle-East North Africa (MENA) in 2017 and South East Asia in 2018. Black Desert Online uses a free-to-play model in Korea, Japan and Russia, while in Taiwan, South East Asia, Europe, North America and South America the game uses a buy-to-play model. Black Desert Online debuts on Xbox One, PS4, and PC in 2014 in Korea. Now BDO has EU, US, and Asia servers and published worldwide. BDO provides up to 16 classes for gamers: Warrior, Ranger, Sorceress, Berserker, Tamer, Musa, Maehwa, Dark Knight, Valkyrie, Kunoichi, Ninja, Wizard, Witch, Striker, Mystic, and Archer, each of them is distinctive in playing style and teamwork. Gears in Black Desert Online need to repair when the durability decreased. Mounts like horse, boat, elephant are purchasable from merchant NPCs. Join the game in an open world seamless world and create your own house and furniture. 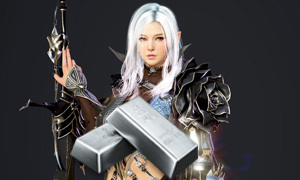 Why buy Black Desert Online Silver from Joymmo.com? All servers (EU & NA) are supported; All different devices are available, such as Microsoft Windows, Xbox One, and PlayStation 4. More than 10 years’ experience of game currency service wins a wonderful reputation from among players. Buy Cheap BDO Silver from us now!